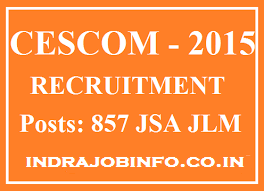 CESCOM JLM Recruitment 2015: CESCOM recruitment 2015 has invited the application from the eligible candidates for the post of Junior Lineman 857 jobs. The application form are invited through the online mode. Aspirant should check the official site www.cescmysore.org to download the CESCOM notification and apply online application for CESCOM Junior Lineman jobs 2015. The online application starts from June 12th 2015. Further details of the CESCOM JLM recruitment 2015 available in this webpage. Candidates should bookmark our site indrajobinfo.co.in by pressing CTRL+D then regularly visit our site. We have to update the job notification in our site on every day. Eligible and interested applicant may apply the online application at the official website. We are advised to the candidates should apply online application before 02-07-2015 for CESCOM JLM recruitment 2015. Other details like as educational qualification, pay scale, age limit and how to apply details given here. Candidates who are waiting for the government Junior Lineman job can apply the CESCOM JLM vacancy 2015. Name of Post: Junior Lineman (JLM). No of Vacancy: 857 Posts. Category of Jobs: Government Job. Scale of Pay: Rs. 7350/- to Rs. 15,000/- after the training period. Aspirant age limit must be not less than 18 years. Age relaxation will be available to the candidates as per the government guidelines. Qualification: Application should complete the SSLC/10th standard from any recognized state board of school in Karnataka state. For category I, IIA, IIB, IIA, IIIB & General candidates: Rs.200/. The candidates who are fulfill the eligibility criteria may apply the online application at the official site. The online application for CESCOM Junior Lineman recruitment applicants must apply before 02-07-2015. In case of incomplete application will be rejected by the CESCOM JLM recruitment 2015. Starts date of online application form: 12-06-2015. End date of online application form: 02-07-2015. Last date of receipt of application form: 13-07-2015. Click to Download the CESCOM JLM Recruitment Notification 2015. Apply the Online Application for CESCOM Junior Lineman Jobs 2015.